This page provides general guidelines in the use of the university’s various graphic representations. These guidelines should be adhered to in the production of any communication pieces representing UAPB and its many entities. The standards presented here pertain to the institutional side only. For details concerning use of the Lion head logo, please refer to the Athletics Standards Guide. If you have questions about the branding guidelines presented here, please contact the Office of Communications via communications@uapb.edu. Only the approved marks represented here can be used or reproduced on any material associated with the University of Arkansas at Pine Bluff, its name or symbolic representations thereof. On second reference, use of “the university” or “UAPB™” is preferred. The use of the name “University of Arkansas at Pine Bluff™” and symbols for commercial purposes is restricted. The trademark licensing office, as part of a licensing agreement with Collegiate Licensing Company, coordinates requests for commercial use of the university’s name and symbols. A link to an official university website should be listed on the front or back of all pieces. It is encouraged that the designing department and month/year of publication appear on the back, preferably in small print. Appropriate printing procedures must be followed. The standards outlined here represent procedures for the use of official symbols on promotional and printed material. Approval of marks and logos for merchandise or retail sale must be obtained through the Office of Communications. The approved licensed vendors list can be found here. The University of Arkansas at Pine Bluff practices a model of brand architecture that features the university’s O’Bryant Bell Tower logo as the primary identifier in all communications. The standardized and proper use of the university’s O’Bryant Bell Tower logo and other symbolic representations play a significant role in making our university great. To reinforce the university O’Bryant Bell Tower logo – and thereby the university itself – as our foundation, our identity system prohibits the use of any additional pictorial representations, marks or artwork in conjunction with the university O’Bryant Bell Tower logo or any supplemental signature. The elements of UAPB's identity are trademarks and as such, are property of the University of Arkansas at Pine Bluff and may only be used by authorized units of the university or through approval for external use. These elements are for authorized units of the university, including departments, administrative units, academic and research centers, and other official parts of the university. Students and student groups are not allowed to use these elements without special permission from the Office of Communications. The seal is intended for official documents (diplomas, certificates and the like) and is limited to the chancellor’s office, the board of trustees, and official university awards and recognition. The Legacy Seal symbolizes the formal authority vested in the university. Use of the Legacy Seal is not permitted on products for resale. This restriction includes the overlaying or intersecting of other graphics with the seal. The seal is not available for download, and special permission must be obtained for official use. The Golden Lion represents the spirit of UAPB, and is not to be used for academic or general promotional purposes. The use of the athletics logo is limited to sports teams, athletics marketing communications, and trademarked merchandise.Do not integrate the Golden Lion with unapproved symbols or marks or use it to replace a letter or part of one. Designs/logos that utilize the shape or outline of the lion or superimpose other words or elements on top of this figure are not acceptable. The athletics logo is not available for download. It must be obtained from the Office of Communications. Please note, the new mark is a right-facing lion as opposed to the one which faced left. The left-facing lion has been retired as a spirit symbol. The wordmark consists of the university’s initialism “UAPB” and an adjusted letterform version of the name “University of Arkansas at Pine Bluff” combined with the baseline (that includes the established date), which anchors and protects the integrity of the wordmark. The university wordmark should always appear with the O’Bryant Bell Tower graphic to form the university logo, unless special permission has been given by the Office of Communications. It should be used for promotional and academic materials, college or school publications, and other nonathletic materials. The UAPB logo is made up of two parts: the wordmark and the W.E. O’Bryant Bell Tower graphic. The university logo anchors the entire visual identity system. It is used on all communications, and its effectiveness relies on consistent presentation. Official electronic artwork should always be used, and the spacing and positioning of the logo elements should not be recreated or altered for any reason. The iconic W.E. O’Bryant Bell Tower accompanies the wordmark and the university’s initialism to create the university logo. The O’Bryant Bell Tower graphic must never appear separately from the wordmark. The condensed version of the O’Bryant Bell Tower logo is to be used strictly in Social/Digital Media applications. This variation includes the bell tower, the university initialism and the baseline. These variations represent the only acceptable forms of the logo that do not include the university’s wordmark. The digital version requires a protected area of one square-inch clearance in all directions around the logo. The minimum size for digital variations of the logo is 72 pixels. In special uses, the condensed logo may be used on approved promotional items. Contact the Communications Office for more information at communications@uapb.edu. There are three approved configurations of the logo, of which O’Bryant Bell Tower logo (1) is the preferred. The vertical and horizontal versions are distinct versions with special use circumstances as defined below. The logos must not be recreated or altered in any wa y.
Horizontal logo (second choice) The horizontal configuration may be used in circumstances where it is impractical to use the preferred O’Bryant Bell Tower logo version. Vertical stacked logo (limited use) In cases where the logo isn’t feasible, the wordmark may be used without the initialism, but must be accompanied by the Bell Tower. It can be used in horizontal or vertical configuration as shown. “Clear space” is the protected area around the logo that maximizes its impact. This protected area is defined as twice the height of the ‘U’ in ‘UNIVERSITY’. This space must be kept free of all other graphics and text, including other logos. It is also the minimum distance the logo can be from the edges of an electronic document or printed piece. To preserve the university logo’s prominence, no additional pictorial images, marks or artwork may be used in conjunction with it. Approved secondary identity elements may be used as supporting art, but they should always be clearly separated from the logo. In print and digital uses, any configuration of the logo must have its clear space. To receive a copy of the logos, contact the Communications Office at communications@uapb.edu. Consistent use of typography is a simple way to align our visual identity. Fonts set a cadence for how communication is read and can do a lot to alleviate denseness on the most text-heavy pages. Based on their clean lines, usability and compatibility with the O’Bryant Bell Tower logo, Minion Pro and Univers have been chosen as our official university fonts. Arial is the preferred desktop font for business documents, email, PowerPoint presentations and other office needs. When a serif font is absolutely necessary, Times New Roman should be used, but Arial remains the preferred default typeface. The official colors of UAPB are black and gold. Because of the requirements for printing and the need to be as specific as possible when matching colors, the Pantone® Matching System (PMS) number for the gold is Pantone 130C. The only two-color combination allowed for the O’Bryant Bell Tower logo is Pantone Black and Pantone 130 C for the gold. 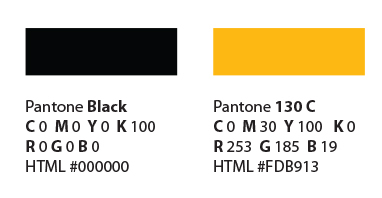 Pantone 130 C gold and black are the UAPB brand colors. All pieces produced by the university should use these two colors predominately. A broad palette of soft and vibrant colors has been developed to complement the institutional gold and black, but should be used as accent colors. Black - for use when ink colors are restricted or the use of gold creates a design conflict. (However, remember to always incorporate a presence of gold in your design.) There are two versions of the O’Bryant Bell Tower logo designed to maximize its impact when it appears on black, or some other dark background. One-color (black logo) with gold background. This option should not be used on a white background. One-color reverse (gold logo) with black background. This option should be used on black or dark backgrounds. The example on this page illustrates how the O’Bryant Bell Tower logo will incorporate the various departments, colleges and centers that fall under the parent brand of UAPB. Both the O’Bryant Bell Tower logo and horizontal versions are featured. Minimum size requirements still apply to these uses. 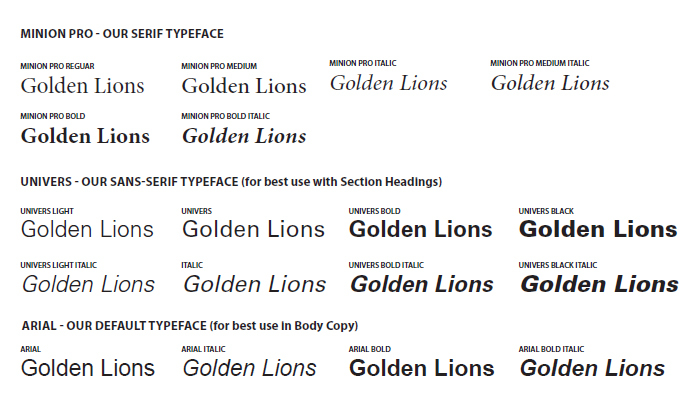 The font Univers Regular is used for body copy on the letterhead and business card. To get stationery printed, please contact Printing Services via printing@uapb.edu or (870) 575-8741. Below are the guidelines to use when placing the University of Arkansas at Pine Bluff on promotional items. If you have any questions about getting the proper artwork for your project, contact the Communications Office at communications@uapb.edu. We'll be happy to assist you. Please note that compatible files for production will be sent to the vendor only. You will receive a web resolution version of your file. For more information about becoming a licensed vendor, please contact John Kuykendall at kuykendallj@uapb.edu or (870) 575-8498. The vertical bell tower logo should be used on cups and hats unless otherwise approved by the Communications Office. If the item the logo is being imprinted on is a color other than white, please refer to the color variation standards section in tab 2 of this page. Table covers are available in PMS 130C only. The condensed logo is used on the left with the name of the department, unit, or program on the right followed by the full name of the institution. The vertical or horizontal bell tower logo may be used on bags and totes as appropriate. If the item the logo is being imprinted on is a color other than white, please refer to the color variation standards section in tab 2 of this page. The vertical bell tower logo should be used on academic apparel. Athletics marks are to be used on Athletic apparel by licensed vendors only. For more information about becoming a licensed vendor, please contact John Kuykendall at kuykendallj@uapb.edu or (870) 575-8498. If the item the logo is being imprinted on is a color other than white, please refer to the color variation standards section in tab 2 of this page. The condensed bell tower logo may be used on pens and pencils as appropriate. The full spelled out version of the institution's name is also allowed. The official university folder can be purchased via Central Stores and Receiving by calling (870) 575-8372. If the item the logo is being imprinted on is a color other than white, please refer to the color variation standards section in tab 2 of this page. The following are examples of inappropriate uses of UAPB’s identity elements. When there is a question, please contact contact the Office of Communications at communications@uapb.edu. 1. Do not change the proportion of the O’Bryant Bell Tower logo. Always scale it proportionally. 2. Do not change the colors of the O’Bryant Bell Tower logo. 3. Never alter the wordmark or any visual elements, and do not change the font of the wordmark or accompanying names of colleges or divisions. 4. 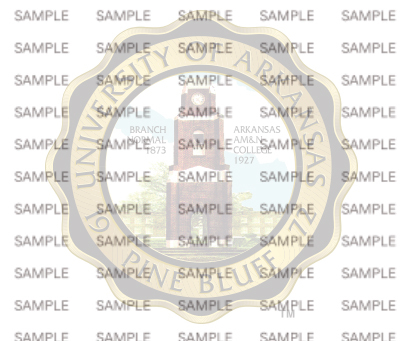 Never overprint something on top of the O’Bryant Bell Tower logo, and do not use it as a background pattern. 5. Never place the O’Bryant Bell Tower logo or wordmark at an angle. 6. Do not duplicate an approved treatment by substituting a departmental, office or center name. 7. Do not use the legacy seal with the O’Bryant Bell Tower logo. 8. Do not use the one-color gold O’Bryant Bell Tower logo with the background on white. 9. Do not use the O’Bryant Bell Tower logo graphic without the wordmark in any printed used. This is reserved in digital uses. 10. Do not apply any kind of outer glow on the logo. A one color version should be used instead in the approved colors (black, gold or white).